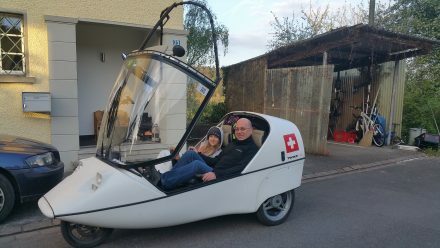 Welcome to the first entry of this year’s TWIKE adventure, TDE2017! 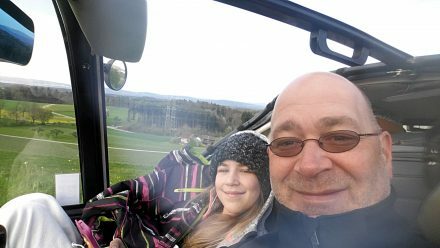 Both my daughter and I have been looking forward to this trip very much, since – at least for the first part – is a re-run of the trip we embarked on last year (TDIN2016) and had to abandon because of some problems. So here we are, this morning, bright and early, ready to leave! 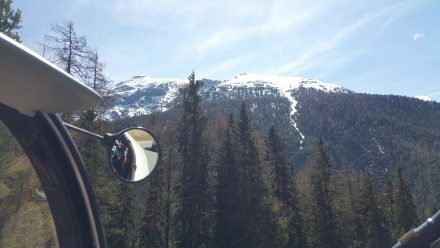 Our trip today will take us to Livigno, Italy, via the Graubünden Alps and most of northeastern Switzerland. Since I’ve driven this direction already many, many times, it’s getting increasingly difficult to put together a route TW560 and I haven’t already done. 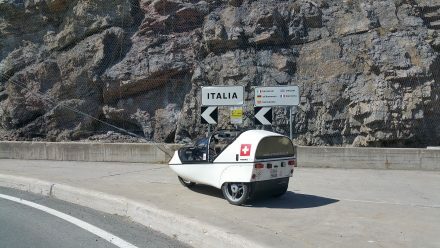 The other option would have been to take the motorway, but that, again, would have been against the spirit of a TWIKE Adventure. Again, thanks to the help of MyMaps from Google, I was able to put together a route that contained virgin stretches of road for TW560 and myself. 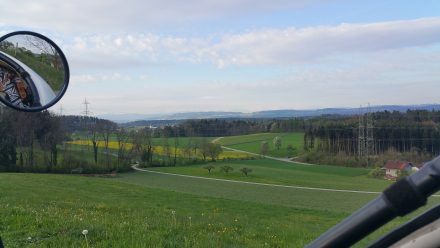 After Effretikon, we get our first climb and subsequent views of the Alps. 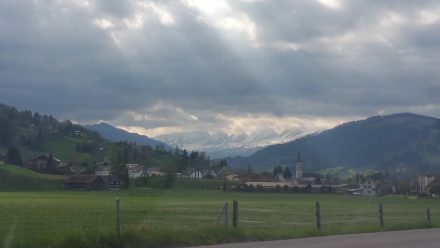 Eventually, we reach the Toggenburg region with its distinctive Churfirsten range, about which I’ve already written about a few times (one example) here on this blog. 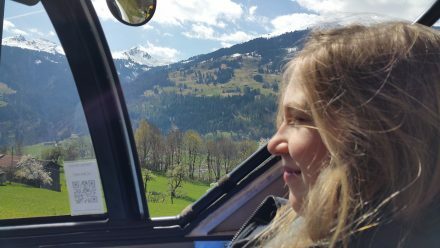 My daughter noted that it was weird to see such flatness in Switzerland and that the view was spectacular. We crossed in and out of Lichtenstein within just a few km and made our way to the upper Rhine valley. Here in Maienfeld, center of so-called Heidiland, droves of Japanese and Korean Tourists seek to experience the real Heidi landscapes and villages whilst retracing the (fictional) story. 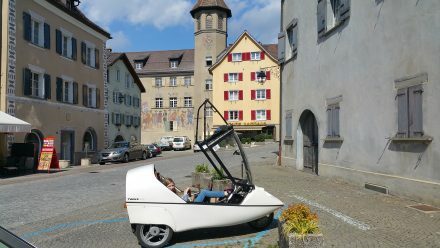 For us living in Switzerland, Maienfeld is also known for some surprisingly drinkable wines due to the favourable weather there. 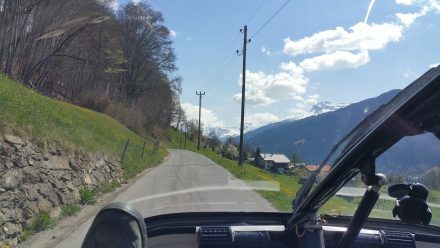 Leaving the upper Rhine valley, we start climbing towards Klosters and the Vereina car train which will take us to the Engadin valley, since all alpine passes are still closed due to snow. As always, we immediately leave the main road and start skirting along the valley sides and drive from small farm to small farm on very small roads. 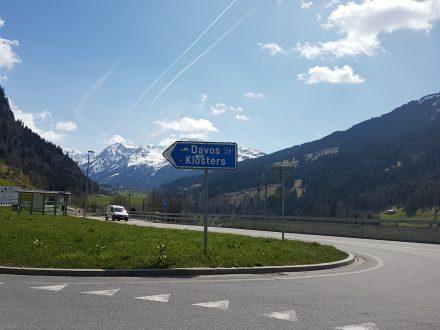 Our favourite type of road! 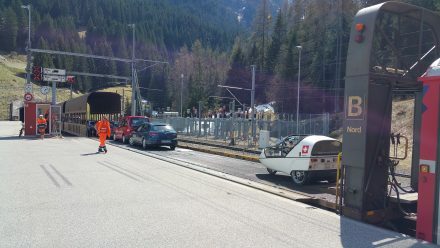 To get to the Engadin valley, we take the Vereina car train which runs aproximately every 15-20 mins. It’s always an interesting discussion regarding the type of vehicle we should be paying for… This time they take it very seriously and ask for the vehicles registration papers! Lucky us, that the result of this in-depth process is us only paying the price of a 125cc motorbike! We get to the train as one of the last vehicles and without waiting, the train departs more or less right after we’re on. 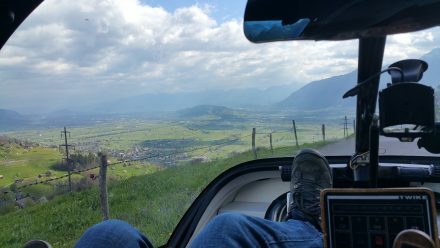 It’s always fun to be sitting in a stationary TWIKE and still move! See for yourself! 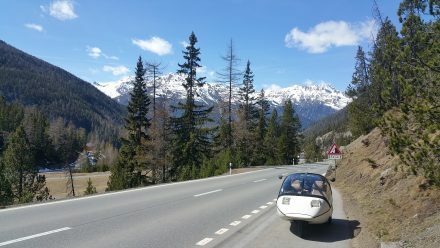 After arriving in the Engadin valley, we only have about 6km of road before we take a left hand turn and head up another valley towards the weird tunnel that takes you through a mountain more or less directly onto a dam and a few 100 metres afterwards to Italy. 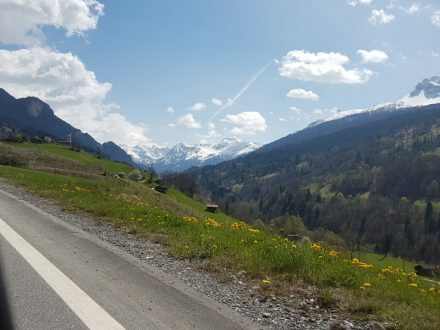 The climb takes us trough parts of Switzerland’s largest national park – pristine alpine nature and beautiful weather result in postcard-grade views all along the road! 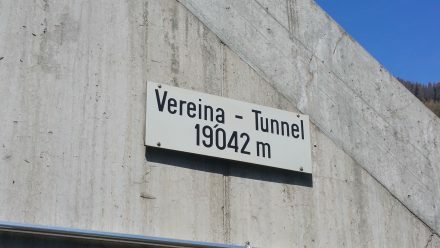 We’ve climbed to 1850m altitude and arrive at the entrance to the tunnel to Livigno. 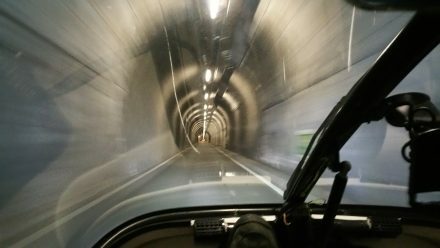 This tunnel single-lane and therefore switches directions every 15 minutes. 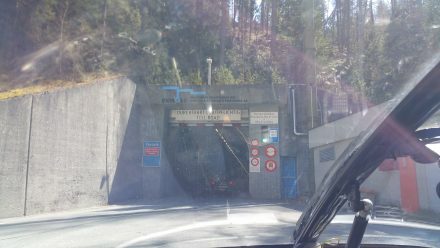 Again, within 2 minutes of us arriving, the green light goes on and we can proceed into the tunnel. 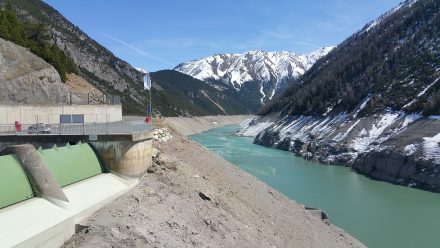 20 m outside the tunnel entrance on the other side, we stop and admire the dam and surrounding mountains. Hydro electric dam in need of some water! Just across the dam, we’re greeted by Italy. 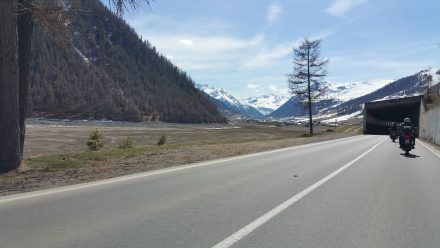 The drive to Livigno along the lake is very relaxing. 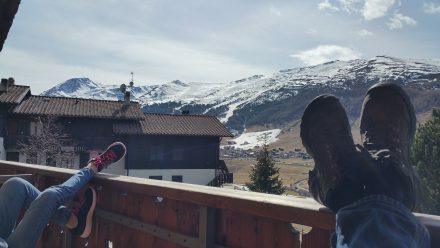 Even though we’re at 1870m altitude, temperatures are warm and the sun is reflecting off the white peaks around Livigno valley. Livigno itself isn’t very attractive – most of it caters to tourism and duty-free business. We are, however, in Italy and this means: good food! 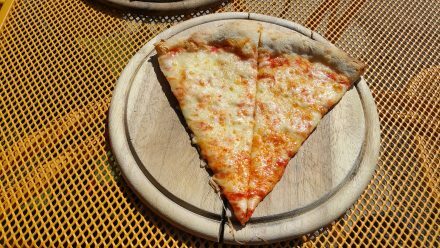 Since we didn’t eat any lunch, we stopped for a slice of pizza which we ate outside in the sun -> pure bliss! We didn’t do much for the rest of the afternoon – relaxing and soaking in the sun…before heading to a restaurant later that evening for some more delicious food. See our track for today, below.